From the trailhead, first ski south-east, then south to lake 1282, located just east of a col named Blåbergeidet. Cross this col (ski right to avoid a possible cornice). Descend into the valley at the opposite side and ski down to Blåbergdalen. Cross left in order to save some elevation as well as distance, just before hitting Blåbergdalen. Cross Blåbergdalen going south, you will then see the distict valley going up east of Midtnuten. This valley is the key to further progress. Ski up this valley to its top col, then ascend more steeply to your left. The terrain becomes more gentle and the route now continues more or less directly to Breifonn. I skied this peak directly after climbing Blåbergnuten. Thus, I descended directly down towards Blåbergdalen. 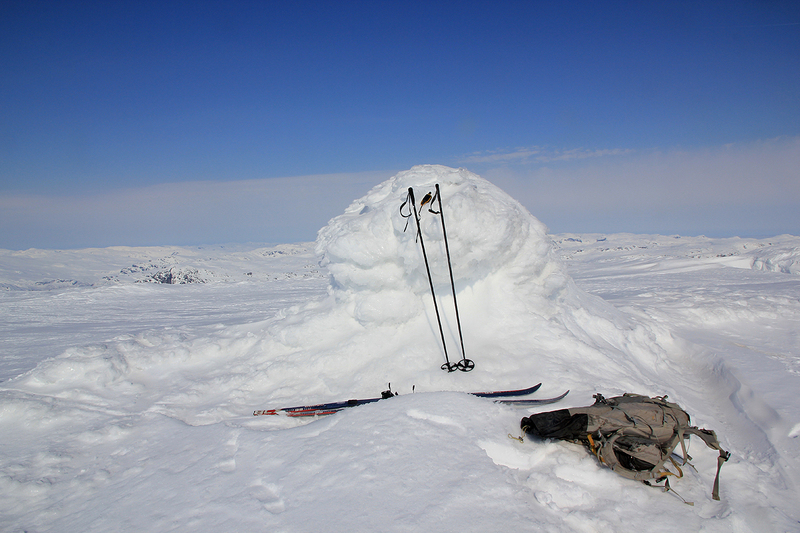 The way to do this, is first to ski west from the Blåbergnuten summit, then south. The climb was straightforward and I arrived at the summit around 1330, about 2.5 hours after leaving Blåbergnuten. I skied back along the route described above, arriving at my car around 1630, about 2:40 after leaving the Breifonn summit.